On a prograde planet like the Earth, the sidereal day is shorter than the solar day. At time 1, the Sun and a certain distant star are both overhead. At time 2, the planet has rotated 360° and the distant star is overhead again (1→2 = one sidereal day). But it is not until a little later, at time 3, that the Sun is overhead again (1→3 = one solar day). More simply, 1-2 is a complete rotation of the Earth, but because the revolution around the Sun affects the angle at which the Sun is seen from the Earth, 1-3 is how long it takes noon to return. Solar time is a calculation of the passage of time based on the position of the Sun in the sky. The fundamental unit of solar time is the day. Two types of solar time are apparent solar time (sundial time) and mean solar time (clock time). A tall pole vertically fixed in the ground casts a shadow on any sunny day. At one moment during the day, the shadow will point exactly north or south (or disappear when and if the Sun moves directly overhead). That instant is local apparent noon, or 12:00 local apparent time. About 24 hours later the shadow will again point north/south, the Sun seeming to have covered a 360-degree arc around the Earth's axis. When the Sun has covered exactly 15 degrees (1/24 of a circle, both angles being measured in a plane perpendicular to the Earth's axis), local apparent time is 13:00 exactly; after 15 more degrees it will be 14:00 exactly. The problem is that in September the Sun takes less time (as measured by an accurate clock) to make an apparent revolution than it does in December; 24 "hours" of solar time can be 21 seconds less or 29 seconds more than 24 hours of clock time. As explained in the equation of time article, this is due to the eccentricity of the Earth's orbit (i.e. the Earth's orbit is not perfectly circular, meaning that the Earth-Sun distance varies throughout the year), and the fact that the Earth's axis is not perpendicular to the plane of its orbit (the so-called obliquity of the ecliptic). The effect of this is that a clock running at a constant rate – e.g. completing the same number of pendulum swings in each hour – cannot follow the actual Sun; instead it follows an imaginary "mean Sun" that moves along the celestial equator at a constant rate that matches the real Sun's average rate over the year. This is "mean solar time", which is still not perfectly constant from one century to the next but is close enough for most purposes. Currently a mean solar day is about 86,400.002 SI seconds. The two kinds of solar time (apparent solar time and mean solar time) are among the three kinds of time reckoning that were employed by astronomers until the 1950s. (The third kind of traditional time reckoning is sidereal time, which is based on the apparent motions of stars other than the Sun.) By the 1950s it had become clear that the Earth's rotation rate was not constant, so astronomers developed ephemeris time, a time scale based on the positions of solar system bodies in their orbits. The apparent sun is the true sun as seen by an observer on Earth. Apparent solar time or true solar time is based on the apparent motion of the actual Sun. It is based on the apparent solar day, the interval between two successive returns of the Sun to the local meridian. Solar time can be crudely measured by a sundial. The equivalent on other planets is termed local true solar time (LTST). 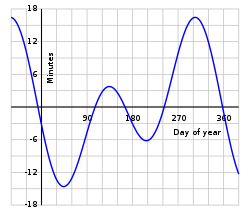 The length of a solar day varies through the year, and the accumulated effect produces seasonal deviations of up to 16 minutes from the mean. The effect has two main causes. First, Earth's orbit is an ellipse, not a circle, so the Earth moves faster when it is nearest the Sun (perihelion) and slower when it is farthest from the Sun (aphelion) (see Kepler's laws of planetary motion). Second, due to Earth's axial tilt (known as the obliquity of the ecliptic), the Sun's annual motion is along a great circle (the ecliptic) that is tilted to Earth's celestial equator. When the Sun crosses the equator at both equinoxes, the Sun's daily shift (relative to the background stars) is at an angle to the equator, so the projection of this shift onto the equator is less than its average for the year; when the Sun is farthest from the equator at both solstices, the Sun's shift in position from one day to the next is parallel to the equator, so the projection onto the equator of this shift is larger than the average for the year (see tropical year). In June and December when the sun is farthest from the celestial equator a given shift along the ecliptic corresponds to a large shift at the equator. So apparent solar days are shorter in March and September than in June or December. These lengths will change slightly in a few years and significantly in thousands of years. The equation of time—above the axis a sundial will appear fast relative to a clock showing local mean time, and below the axis a sundial will appear slow. Mean solar time is the hour angle of the mean Sun plus 12 hours. This 12 hour offset comes from the decision to make each day start at midnight for civil purposes whereas the hour angle or the mean sun is measured from the zenith (noon). Currently (2009) this is realized with the UT1 time scale, constructed mathematically from very long baseline interferometry observations of the diurnal motions of radio sources located in other galaxies, and other observations. The duration of daylight varies during the year but the length of a mean solar day is nearly constant, unlike that of an apparent solar day. An apparent solar day can be 20 seconds shorter or 30 seconds longer than a mean solar day. Long or short days occur in succession, so the difference builds up until mean time is ahead of apparent time by about 14 minutes near February 6 and behind apparent time by about 16 minutes near November 3. The equation of time is this difference, which is cyclical and does not accumulate from year to year. Consider a first fictitious Sun travelling along the ecliptic with a constant speed and coinciding with the true sun at the perigee and apogee (when the Earth is in perihelion and aphelion, respectively). Then consider a second fictitious Sun travelling along the celestial equator at a constant speed and coinciding with the first fictitious Sun at the equinoxes. This second fictitious sun is the mean Sun..."
The length of the mean solar day is slowly increasing due to the tidal acceleration of the Moon by the Earth and the corresponding slowing of Earth's rotation by the Moon. Many methods have been used to simulate mean solar time. The earliest were clepsydras or water clocks, used for almost four millennia from as early as the middle of the 2nd millennium BC until the early 2nd millennium. Before the middle of the 1st millennium BC, the water clocks were only adjusted to agree with the apparent solar day, thus were no better than the shadow cast by a gnomon (a vertical pole), except that they could be used at night. But it has long been known that the Sun moves eastward relative to the fixed stars along the ecliptic. Since the middle of the first millennium BC the diurnal rotation of the fixed stars has been used to determine mean solar time, against which clocks were compared to determine their error rate. Babylonian astronomers knew of the equation of time and were correcting for it as well as the different rotation rate of the stars, sidereal time, to obtain a mean solar time much more accurate than their water clocks. This ideal mean solar time has been used ever since then to describe the motions of the planets, Moon, and Sun. ^ Astronomical Almanac Online. Archived 2015-11-08 at the Wayback Machine (2011) Her Majesty's Nautical Almanac Office and the United States Naval Observatory. Glossary s.v. solar time. ^ Leap Seconds. Archived 2015-03-12 at the Wayback Machine (1999). Time Service Department, United States Naval Observatory. ^ For the three kinds of time, see (for example) the explanatory section in the almanac Connaissance des Temps for 1902, page 759 Archived 2011-08-10 at the Wayback Machine. ^ Astronomical Almanac Online Archived 2008-09-14 at the Wayback Machine (2010). United States Naval Observatory. s.v. solar time, apparent; diurnal motion; apparent place. ^ Yallop, B. D. and Hohenkerk, C. Y. (August 1989). Solar Location Diagram Archived 2010-12-24 at the Wayback Machine (Astronomical Information Sheet No. 58). HM Nautical Almanac Office. ^ Allison, Michael; Schmunk, Robert (June 30, 2015). "Technical Notes on Mars Solar Time as Adopted by the Mars24 Sunclock". Goddard Institute for Space Studies. National Aeronautics and Space Administration. Archived from the original on September 25, 2015. Retrieved October 8, 2015. ^ Allison, Michael; McEwen, Megan (2000). "A post-Pathfinder evaluation of areocentric solar coordinates with improved timing recipes for Mars seasonal/diurnal climate studies". Planetary and Space Science. 48 (2–3): 215. Bibcode:2000P&SS...48..215A. doi:10.1016/S0032-0633(99)00092-6. Archived from the original on June 23, 2015. ^ a b Jean Meeus (1997), Mathematical astronomy morsels (Richmond, VA: Willmann-Bell) 346. ISBN 0-943396-51-4. ^ McCarthy, D. D. & Seidelmann, P. K. (2009). TIME From Earth Rotation to Atomic Physics. Weinheim: Wiley-VCH Verlag GmbH & Co. KGaA. ISBN 978-3-527-40780-4. pp. 68, 326. ^ Capitaine, N., Wallace, P. T., & McCarthy, D. D. (2003). "Expressions to implement the IAU 2000 definition of UT1" Archived 2016-04-07 at the Wayback Machine, Astronomy and Astrophysics, vol.406 (2003), pp.1135-1149 (or in pdf form); and for some earlier definitions of UT1 see Aoki, S., H Kinoshita, H., Guinot, B., Kaplan, G. H., D D McCarthy, D. D., & Seidelmann, P. K. (1982) "The new definition of universal time", Astronomy and Astrophysics, vol.105 (1982), pp. 359-361. ^ For a discussion of the slight changes that affect the mean solar day, see the ΔT article. ^ Meeus, J. (1998). Astronomical Algorithms. 2nd ed. Richmond VA: Willmann-Bell. p. 183. ^ :(1) In "The Physical Basis of the Leap Second", by D D McCarthy, C Hackman and R A Nelson, in Astronomical Journal, vol.136 (2008), pages 1906-1908, it is stated (page 1908), that "the SI second is equivalent to an older measure of the second of UT1, which was too small to start with and further, as the duration of the UT1 second increases, the discrepancy widens." :(2) In the late 1950s, the cesium standard was used to measure both the current mean length of the second of mean solar time (UT2) (result: 9192631830 cycles) and also the second of ephemeris time (ET) (result:9192631770 ± 20 cycles), see "Time Scales", by L. Essen Archived 2008-10-19 at the Wayback Machine, in Metrologia, vol.4 (1968), pp.161-165, on p.162. As is well known, the 9192631770 figure was chosen for the SI second. L Essen in the same 1968 article (p.162) stated that this "seemed reasonable in view of the variations in UT2". Astrarium Solar Tempometer: Apparent solar time in a digital display.